Signage at medical facilities is key to making everything run smoothly. It may be easy to overlook, because effective medical signage works so intuitively that you might not even notice it. But when you consider the factors that drive the function of many medical facilities—emergencies and urgent situations that involve rushing to get patients and personnel to the appropriate places; gigantic and confusing facilities with many floors, rooms and corridors; countless people coming and going every day, most of whom are visitors or guests who are not already familiar with the layout of the facility—signage really is the only way to a make medical facility accessible and navigable to everybody. 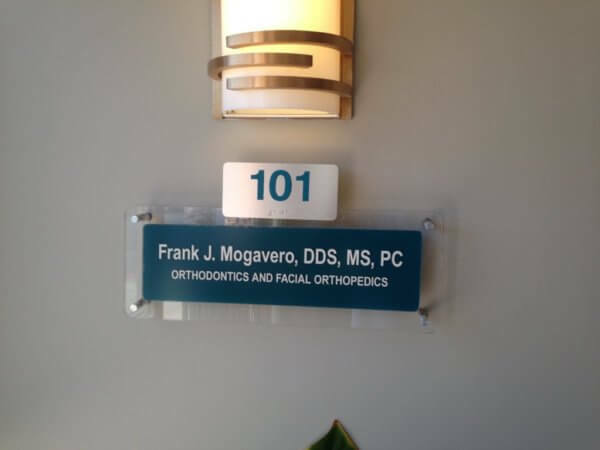 Blade signs are a type of sign that are typically installed perpendicular to a wall, to allow people to read them from a distance and without having to stop and look directly at a room or hallway. Many people associate blade signs with outdoor shopping centers, but they are one of the most important type of signs for medical facilities as well. With the length of the hallways in medical facilities, and the different types of people who may be unfamiliar with the particular floor or corridor or even building, it is important to be able to see and notice signs from down the hall and without having to stop at every door to read the sign. Blade signs help people coming from both directions and can also give visual cues of which direction to continue walking, using arrows. The lobby sign may be the first image that greets visitors to a medical facility. It is important for several reasons. First of all, it is the first impression that people get when they enter the facility. Especially at a place where client’s health and safety are involved, using the lobby sign to convey a feeling of reliability and trustworthiness is an important way to begin. More importantly, though, a lobby sign provides confirmation to visitors that they are in the right location. 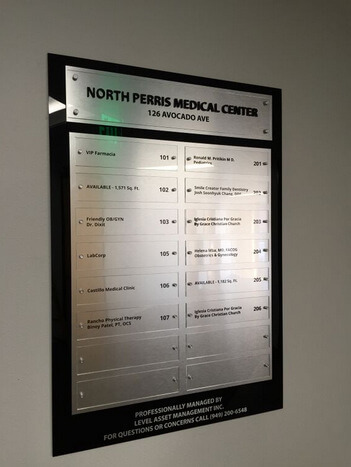 Directory signs are used to help people locate their destination within the building, and can be particularly helpful in a facility that houses many different physicians or other health care service providers. A Directory Sign needs to be well designed, intuitive, and legible to help all types of people entering the building quickly find the information they need to get where they need to go without delay. The lobby and directional signs are only the beginning of the navigation process through the medical facility. As people move down halls and between floors, they will continually need to be prompted with instructions and reminders to help them find specific places—cafeterias, chapels, lobbies, floors or halls dedicated to specific types of medical disciplines, and even just ranges of room numbers. Directional signs and graphics can be hung from the ceiling, stuck to the floor, mounted on walls, and more, all depending on the situation and the content of the sign. Medical facilities can have hundreds if not thousands of different rooms. Each one of these rooms needs to be appropriately labeled with a unique number. In many cases, the rooms also need to have different types of information on signs, such as the names of the doctors or departments or equipment inside of them. When it comes to rooms for patients, specifically, it can also be important to be able to add and easily change out temporary information with the name of the patient and their allergies, health risks, and other essential information for the on-duty medical staff. All types of signs in the hospital must be equipped to be read by people with disabilities. Signs are required to follow laws and regulations about legibility and application of braille and tactile lettering for people with visual impairments. No matter the size or type of your medical facility, Starfish Signs and Graphics has the solution to all your custom medical signage needs. Our experts are well versed in needs and regulations related to the healthcare industry. Our designers also offer valuable insight about choosing the materials and design features that work best for both functionality and visual appeal and brand consistency. 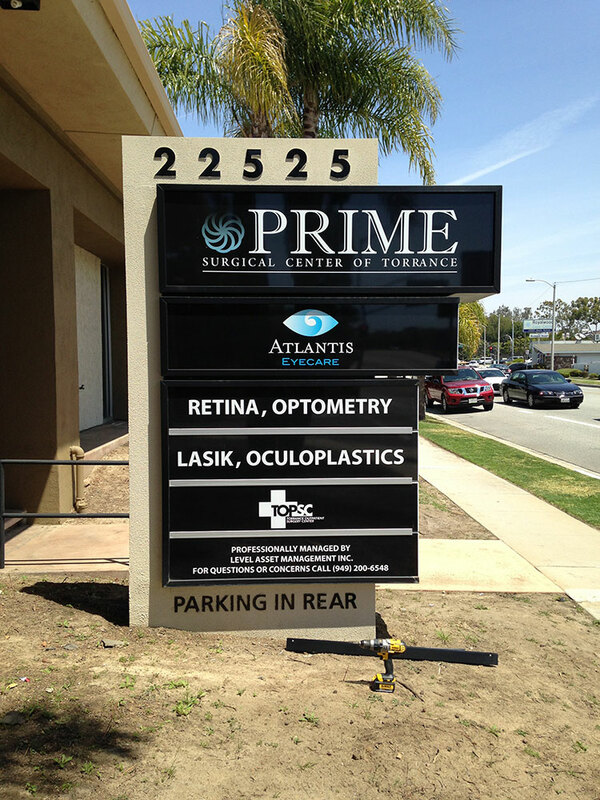 We fully customize signs to your exact needs and specifications. Whether you know exactly what you need or you are just beginning the process and would like guidance, you can count on our team to help get you the solution you need. Contact us today to get started.